Tasty cherrywood-smoked Canadian bacon, a peppered egg patty and reduced-fat white cheddar on a gluten free roll. It's all prepared in a certified gluten-free environment and sealed for your safety. We then warm it in its own oven-safe parchment bag to avoid any cross-contamination. 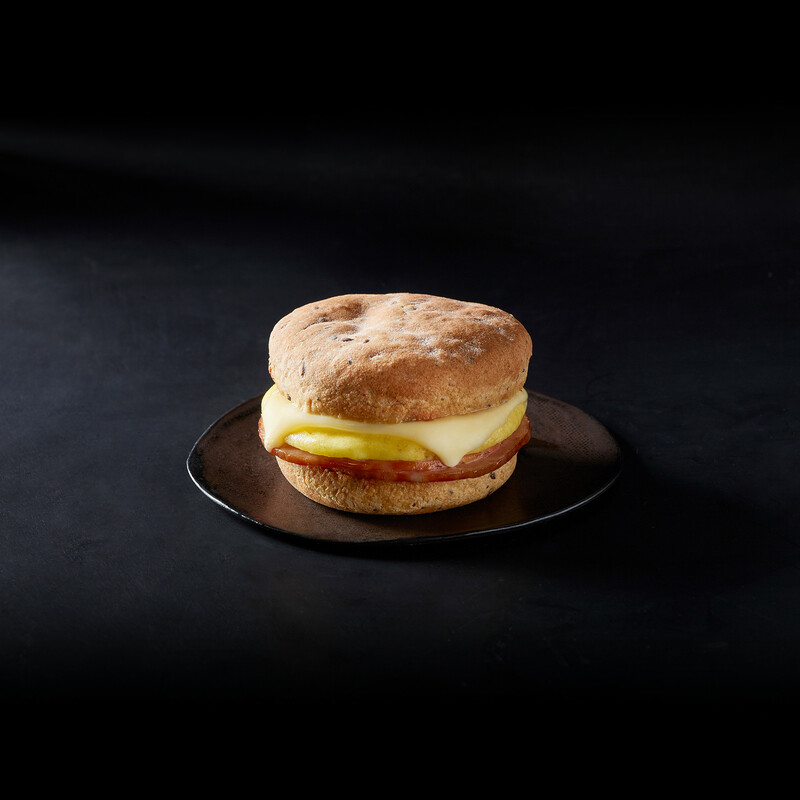 At last, a truly delicious breakfast sandwich for our gluten-free friends. gluten free ciabatta roll (water, tapioca starch, corn starch, canola oil, yeast, rice flour, seed mix [golden millet seed, flaxseed, poppy seed, sunflower seed, quinoa], psyllium husk powder, wholegrain corn flour, sugar cane fiber, egg white powder, potato starch, buckwheat flour, sugar, thickeners [xanthan & guar gums], dried plum puree, rice starch, concentrated grape juice, iodized salt [potassium iodate], cassava flour, preservative [sodium propionate], rice bran, baking soda), scrambled egg patty (whole eggs, water, soybean oil, modified food starch, whey solids, salt, nonfat dry milk and citric acid), uncured* canadian bacon (pork, water, sugar, vinegar and lemon juice concentrate, sea salt, cultured celery juice]), reduced fat cheddar cheese (pasteurized part-skim milk, cheese culture salt, enzymes vitamin a palmitate). * no nitrites except naturally occurring from sea salt and celery.